I smell quid pro quo. Two events occurred on May 21. In exchange for holding down premium increases next year, the administration has promised the insurance industry a bailout worth billions of taxpayer dollars if the insurance companies lose money in the process. The bailout is hidden in regulations that were issued a little over a week ago. 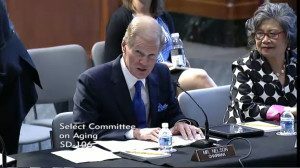 On the same day – May 21 – AHIP and a coalition called C-TAC met with Senator Ben Nelson (D-FL), Susan Collins (RINO-ME), Sheldon Whitehouse (D-RI), Tammy Baldwin (D-WI) and Elizabeth Warren (D-MA) to put on a dog-and-pony show for – or I should say “with” — the Senate Special Committee on Aging. C-TAC issued a press release on the event. I have written about C-TAC before. Read it here. C-TAC is a conglomerate put together by Bill Novelli (former AARP chief); Charles Sabatino of the American Bar Association; and John Koustsoumpas, Jr., senior VP for ML Strategies, a Washington public relations firm. Koutsoumpas’s credentials include former VP at UnitedHealth (a partner of AARP), former senior advisor to Evan Bayh, and board member of the National Hospice Foundation. Incidentally, Bill Novelli was co-founder of Porter Novelli, the firm that won a $20 million contract from HHS to promote Obamacare. Porter Novelli handles the PR for C-TAC. C-TAC unites unabashed Obamacare Democrats and community organizers (e.g., SEIU, National Partnership for Women and Families) with supposedly non-partisan professional groups (who in fact have lobbied for Obamacare) and RINO Republicans. Although it appears that most of what the Obama administration and C-TAC want will be pushed through as regulation rather than legislation, it is worth noting that a few of these senators are sponsoring legislation that would funnel government money into educating and credentialing palliative care. Remember: 1) government money = government ethics. 2) “more services” or “specialized services” for chronically ill people often means substituting palliative care (symptom treatment) for real medical treatment. 3) a focus on “quality of life” often means a shorter life but with what the provider will define as better quality of life. This entry was posted in C-TAC, Care Coordination, Care transitions, Electronic Health Records, Legislation, Obamacare - Affordable Care Act - ACA, Palliative care / palliative medicine and tagged advance care planning, advance directives, CMMI, cronyism, electronic health records EHR, health reform, Obamacare, palliative care, POLST, rationing, shared decision making by Ione Whitlock. Bookmark the permalink.